stocked only by councils, regularly smashed by kids with rocks this is one of Australia's rarest lamps! Manufacturer: Brand, Crompton, Manufacturer, E.L.M.A., Company, Crompton (Aust) Pty. Ltd. Although It does not look like it, this is one of the rarest and most difficult to procure of Australian lamps. This was one of a set of about half a dozen "Street Series" lamps rated in current because they were used on series string constant current circuits which included carbon arc lamps. There were two current ratings, 6.6A and 20A. In the 1930's and 40's many of the carbon arc lamps were replaced by these. This is a late model one made in the 60's and rated in lumens, the older models were rated in C.P. When in use in open luminares with radially corrugated iron shades they were popular targets for local kids with shang-eyes, (sling-shots) and rocks, thousands fell to this fate. I have known about these since I was eight years old when I saw them in a lamp catalogue I was given by the school principal. I sort of understood the concepts of "wattage" and "voltage" marked on almost all the other lamps, but these, with their current and candle-power ratings were an enigma. It took 36 years before I actually got this sample and it took me appearing on national television to actually get it! Once I had it, I did what I had wanted to do for 36 years, find out its "wattage" and "voltage". So I put it on an adjustable current source and ramped up the current to 6.6A. I then measured the voltage drop at this current, then multiplied this with the current to get the power rating, both were a big supprise! This has a 110mm bulb, the same mold used at E.L.M.A. for the 500w G.L.S. lamp. Its voltage measured 13v @ 6.6A giving 86 watts! The colour temperature was about 2800 at these settings indicating things were about correct. So why the miniscule power rating in the huge bulb? I suspect that it is because it is used out in the wet and cold whether and a large bulb runs cool enough to not break form thermal shock in wind blown rain. There is another, similar lamp on this site, It has the two lead-ins bought in close to each other like a jacob's ladder, this presumably pulls an arc at E.O.L. and melts the two lead-ins together, linking the lamp out of the circuit allowing the others in the series string to remain lit. This lamp shows no evidence of such a shorting device, unless it is will hidden inside the base/cap. Bring back Fluorescent and SOX Streetlights. Keep magnetic ballasts. This came from Kolundra Will, that is a long way from you, but still in your state. Get out to Roma, or Charters Towers or some such place and you MAY find one on a dusty upper shelf in some old hardware place or old workshop! Don't hold your breath though. This has a "Scruff" pack, a sheet of single-sided corrugated cardboard wrapped around the lamp, corrugations inward. A thin, printed paper wrapper scruffed-in at the ends holds the whole lot together. It is printed in Crompton's Yellow and Black. I found a blown 500w 32v ELMA on the weekend. It would have been the lamp of which the mould was used to make the one you have. It has a mica disc too. I'll post it up soon. Geez the filament and seals on that low voltage 500 watter must be pretty solid! 32 volts was an industrial standard used in machinery (lathe, milling machine and tool and cutter grinders and the like) to protect the machine user, should the lamp be broken and the lead-ins exposed. Lots of swarf on machine shops presented quite a "short-out" hazard. 32v was also used on remote area gen-sets and medium sized boats. Any Australian 32v volt lamp is quite rare these days. For every 10,000 odd 240v lamps mode, about one or two low voltage full sized lamps rolled out of E.L.M.A. 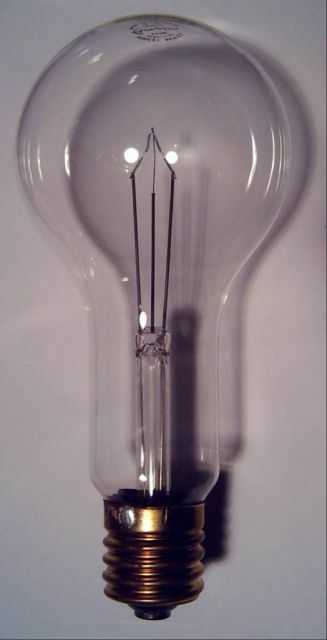 These low voltage lamps differ from the more usual automotive or other types in that they used the same standard bulb sizes and caps as the standard 240v range of lamps. Needless to say. I could imagine there were quite a few frightful "bangs" when unobservant idiots "accidentally" placed them is 240v domestic sockets. I imagine this was also a reason for their demise. The ratings were 6v, (up to 60w only I think), 12v (up to 100w), 24v, (Up to 200w)(commonly used in marine applications as well as 32v), 32v, (which I reckon the 500 watter represents the highest power rated member), 50v, (for the P.M.G. and telcos, to run off exchange batteries), (presumably up to 500w), 75v, for trams, 110v, for North American gear and 240v, the common distribution voltage here in Australia. The rarest are the 75v ones, I have none of these. The 110v ones are pretty scarce too. I imagine there would be thousands of lamps floating about in the samll Medetranian Sea! Wow! I had no idea that 6.6A series streetlighting systems were used in Australia at one point. I have seen old photographs of Hobart showing "Pockell-Bell" type arc lamps hanging on spanwires over intersections in the CBD.. the one that specifically sticks in my mind is one at the intersection of Argyle and McQurie Streets in front of the Museum of which a fellow collector, now deceased, ended up with the internal machanisim and the external housing ended up in the portico of the Altaenaum Club in Davey Street. After the fellow collector passed I was not in a financial position to purchase his collection and it ended up locked away in the basement of the Princess Victoria Museum in Launceston...a Museum run by a nepitistic local Council...a place to "park" their burned out beureaucrats...and anything that ever goes there is permanently out of reach to all. "quite common" around the world...and I recall seeing a piece of old film of Mt. Etna erupting in Sicily and lava piuring into a street with "Pockell-Bell" type arc lamps hanging above. So these things are probably were far more common than you thonk....they would have been used in the U.K., but, like here, is there anyone to remember it. Most big cities would have had carbon arc lamps in the 1880-1920 period and these incandescent lamps were simply another option of a less bright light source for smaller streets that did not require the constant attention of installing new carbon rod electrodes every few hours or each day depending upon the specific lamp design, of which there were many. Series wiring was used because (carbon) arc lamps, like modern high pressure mercury or high pressure sodium lamps are constant current devices that find their own voltage drop...and in carbon arc lamps, where the electrodes burned away slowly. when the electrodes were gone the two electrode holders were left shorted together....if they went open all the other lamps would extinguish. Series circuits would have been interesting though...if rods would have needed replacing during the night all the lamps on that series string would have gone out during the replacement process....I imagine that there was quite a bit of flickering and short period extinguishing as the rods burnt out in the arc lamps on the circuit causing all lamps to flicker be thay another arc lamp or an incandescent like depicted above.